Club sessions consist, mainly, of Men's, Ladies & mixed doubles sets, with everyone mixing in & changing partners & opponents after each set. - Wednesday evenings from 6 p.m.
We're a very social club with most club sessions ending with a drink in the bar of the Fakenham Sports Club. For more information on the Sports Centre click here. ** Fridays by weekly arrangement, please call a member of the committee before turning up. 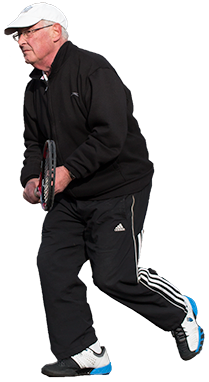 * Sunday club tennis is in the evening on race days - check the Diary Dates to find out when these are.